The riveting and detailed account of the plan to kill Osama bin Laden. Larry David made the cover of Rolling Stone. The issue has several features on David, including Cheryl Hines’s take on their fictional divorce, an interview with Susie Essman, and a discussion with current Curb and former Seinfeld writers. Another prominent TV misanthrope, Louis C.K., was profiled in GQ. The most common specialty for blind mathematicians? Geometry. Geoff Dyer pens the book review of the week. How did you celebrate the tenth anniversary of one of the best comedies of last decade? Anthony Bourdain was on Real Time with Bill Maher, thankfully supplementing some incredibly annoying panelists. He was apparently making the rounds this week, also appearing on The Colbert Report. Political theorist Michael Sandel also recently made a Colbert Report appearance. Spencer and Heidi are now willing to admit some mistakes. 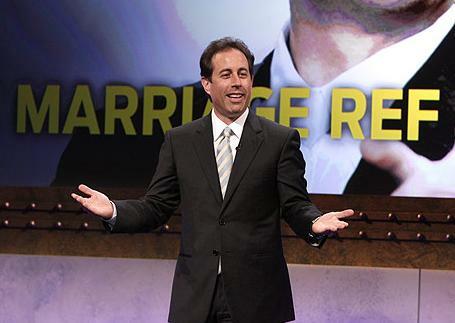 Did The Marriage Ref Single-Handedly Ruin Jerry Seinfeld’s Reputation? In the mood for a little Brett Favre schadenfreude? I thought so. Listen to the despair, and eventually anger, in Paul Allen’s voice as he calls the interception. That, however, is still not as good as Allen’s call of this play from 2003. Josh and John S ranked John Mulaney as our favorite comedian from this past summer. Apparently, we’re not the only ones who liked him: he recently won the Nightlife Awards’ Outstanding Comedian Award for the third year in a row. Speaking of comedians Josh and John S like, Larry David is to receive the Writers Guild of America’s 2010 Paddy Chayefsky Laurel Award for Television, despite (or because of?) the intentional lack of writing in Curb Your Enthusiasm. Somewhat surprisingly, John S and Tim aren’t the only ones to eulogize J.D. Salinger this week. Among our favorites working their way around the interwebs is Garth Risk Hallberg’s take over at The Millions. Ron Rosenbaum’s piece on Salinger last June on Slate helped motivate Tim to consider the unearthing of a vast archive of unpublished material in the author’s New Hampshire home one of his things to look forward to in the Teens. The Winter Olympics are coming up. Or, as Will Leitch called them, the reality TV of sports. Some people, usually not sports fans, think the Olympics are better than real sports. They would be wrong. Bob Dylan is going to perform at the White House. John S can barely contain his enthusiasm. Speaking of the White House, Justice Ruth Bader Ginsburg explains why she dozed off at the State of the Union and what Justice Scalia said to her after Bush v. Gore among other interesting tidbits in her conversation with Nina Totenberg at the 92nd Street Y.
Aught Lang Syne: What John S Is Looking Forward To…. In this final installment Aught Lang Syne’s conclusion, John S presents what he is looking forward to in the coming decade. In case you missed it, Josh posted what he is anticipating here, and Tim posted his here. We at NPI hope you’ve enjoyed our retrospective on the Aughts. In the Teens, I’m looking forward to…. …The Future of Television: I’ve already touched on this, but television is currently at a crossroads. If anything, things have become more dire for the old model. Network television is apparently on its way out, and free television may be a casualty. This, of course, may have disastrous consequences: With free TV gone, shows’ budgets may be severely restricted. As a result, shows will not be able to have big casts, shoot extensively on location, or attract the best talent. In other words, the Golden Age of TV will be over.